The Alberta government should not invest in a high-speed rail link between Calgary and Edmonton at this time, according to a new feasibility report released Friday. High Speed Rail Canada has posted this study. CLICK HERE. It says the population base does not support spending the money. The cost of the line is estimated between $6 billion to $10 billion. Instead, the province should invest in the expansion of light rail transit and other regional transportation systems. So the end result is Alberta next year will have the embarrassing record of having no passenger trains for 30 years between the two cities. 1. 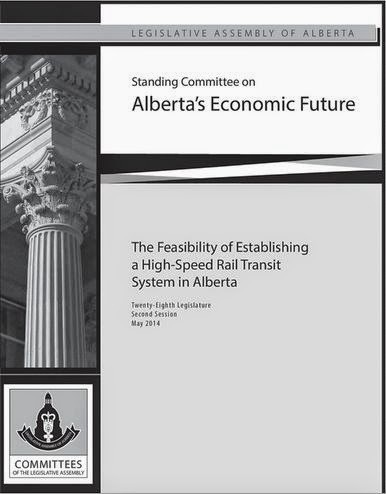 The Government of Alberta should not invest in a high-speed rail transit system in the Edmonton-Calgary corridor at this time because the population of the corridor is not sufficient to support the profitable operation of such a system. 2. The Government of Alberta should include in its long-term transportation infrastructure strategic plan the expansion of light-rail transit and the development of regional transportation systems. 3. As part of the long-term transportation infrastructure strategic plan, the Government of Alberta should identify a greenfield transportation/utility corridor between Calgary and Edmonton to assist in future transportation infrastructure planning with capacity for a potential high-speed rail transit system. 4. The Government of Alberta should begin the process of acquiring land for a transportation/utility corridor right-of-way between Calgary and Edmonton, as budgets warrant, following public consultation with affected landowners, including aboriginal groups. 5. The Government of Alberta should investigate the development of a regulatory model to allow for private investors who can raise both the capital for high-speed infrastructure and procurement of land to be able to go forward to build this necessary infrastructure.